I'll be frank and up front that I am a big fan of the Crosspointe Chronicles fantasy series (The Cipher, The Black Ship, The Turning Tide) by Diana Pharaoh Francis and when I learned that she was writing an urban fantasy I said, "Hell yes!" and asked her if she would guest here when the book was released. 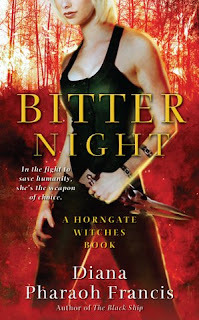 Bitter Night hits the shelves in a little less then a week (Oct. 27) and she is here to introduce you to this first book in the Horngate Witches series.You can read my review here. Diana also advises me that the next book in the series will likely release around the same time next year and has a working title of Crimson Wind. I have a fascination for the Victorians, weather, geology, horses, plants and mythology, I like spicy food, chocolate and cheesecake, and I have an odd sense of humor. (Or so I’ve been told. Often.) Incidentally, the Pharaoh is in fact my real name, and oddly enough, is of British origin. Some of my current favorite sf/f writers are Ilona Andrews, Carol Berg, C.E. Murphy, Patty Briggs, Lynn Flewelling, Rachel Caine, David Coe, and Anne Bishop. 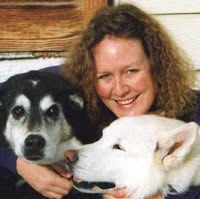 You can discover more about Diana and her books and writing at her website and at her Ad Libs blog. Diana has agreed to drop by and answer any questions you may have (well almost any) so please say hi or leave a comment. I'd also like to share a copy of Bitter Night with one lucky commentator, so if you don't have a specific question for Diana, you can leave a comment about your favourite fictional witch or series (more giveaway details at the end of the post). SFG: With two successful fantasy series already in print, you have your first urban fantasy novel Bitter Night releasing next week. What spurred you to tackle urban fantasy? What is it that you like most about the genre? I like urban fantasy a lot. I’ve been reading it a long time—especially if you think about how The Wrinkle in Time and the Narnia books and Andre Norton’s Witchworld books all have the element of the urban fantasy in them. I was reading those in second grade. I loved the early Laurell K. Hamilton books and Rosemary Edgehill’s Twelve Treasures books and Zelazny’s Amber series. So when I got this idea for Bitter Night, it just felt right to write. As for what I like most about the genre . . . Hmmm. I’m not entirely certain I can pick just one thing. Of course I like magic. And I like the fact that I can use pop culture and slang and real places. I think what’s really captivating to me is how to make the story work in the real world setting. That this sort of thing could really be happening right under our noses and we just don’t know it. It’s the mystique of magical possibility. SFG: Can you give us a quick overview of Bitter Night and the over-reaching story arc for the series? Bitter Night is the story of a woman who gets transformed against her will into a powerful magical predator and is enslaved into the bargain. She’s been fighting against her chains for years, and now she’s got to decide what’s more important—her freedom, or joining forces with the witch who made her in order to save their friends. Because the Guardians of the earth have decided that humanity has encroached too far; magic is suffocating and soon there will be none left, and all the magical creatures of the world will die with it. So they have decided to go to war. They’ve summoned all the witches to serve as generals in their army and when Max’s witch refuses, Max has to decide if revenge is what she wants most. SFG: I love the world-building in Bitter Night with the Sunspears, the Shadowblades and the covensteads. Tell us a little about this world and how you created it. When I started thinking about Bitter Night, I knew there would be witches and I knew there would be rules for them. I also knew that they would have daylight and nighttime warriors. That’s where I began. And then with the Guardians and the rich world of folklore from all over the world, the world just sort of wove itself together. I wanted fire to play an important role, so I picked locations where fire is truly life threatening. I wanted the Shadowblades and Sunspears to be incredibly powerful, and yet not invulnerable. I’ll admit to a little wishful thinking with the whole massive calorie requirements for the Spears and the Blades. Of course, that becomes an achilles heel when they don’t have access to the food they need. Additionally, I wanted the witches to be of the scary variety—they are ruthless and ambitious and they do some pretty horrendous things in the name of good (though they define the nature of ‘good’ and you and I might not agree with that definition). I wanted also to take advantage of all the disasters in the world—from earthquakes to hurricanes to collapsing bridges and sinking ships. I wanted to explain those things and make them part of the story. What I wanted was a world that was truly rich with magical possibility, and yet one that could really exist inside of our own world without any of us knowing about it. Of course, that all changes, or it soon will . . .
SFG: Without giving away any spoilers can you describe a scene or moment in the book that you are most proud of? If I’m forced to pick one, I suppose it would be the very last scene with Giselle and Max. There’s resolution there, but it doesn’t go against either character. There’s compromise, but it’s only as far as either can go. It’s entirely believable and to me, satisfying. SFG: What are your long-term plans for this story universe? Essentially I want to push it forward and show the war, its cost, and its fallout. I want to show how these characters manage during the disaster—the breaking apart of the world as they know it. How will they deal with it? How will they survive and how will they put their lives back together when magic returns full force to the world? SFG: Your Crosspointe Chronicles fantasy series also has magic as a central theme. Can you share a little about the series and where it is heading? I love Crosspointe. It’s this wonderful place of chaotic magic where people think they know how the world works, but they are really blinded by prejudice, tradition and fear. Add in a good dose of intrigue, stubborn, flawed characters, and varying ideas of what’s the right thing to do, and you end up with what I hope are rich, compelling stories that drag you in and won’t let you go. As for where the series is heading . . . I write each on of them to stand alone. The larger political intrigue ties them together, but each story is about individual characters. Certainly there are cameos as characters step onto the pages of other stories, but the books have been very separate. That trend continues in The Hollow Crown (due out in June). I envision two more books in the series after that. In this resolution, many of the original characters will return. I don’t want to say too much more than that. I’m afraid of spoilers. I can say that in The Hollow Crown, things take a serious turn for the worse in Crosspointe. SFG: You teach at the University of Montana Western. Do you have any interesting student or faculty stories about your alternate career as an author that you can divulge? I have such fun teaching, but I don’t tend to talk about the people or the students. I wouldn’t want to break a trust. I can say that I have had some terrifically talented and fun students over the years. SFG: The FAQ on your website has answers to a lot of the usual questions so here a few that hopefully don’t appear there. a. If you could be any paranormal creature, which one would you be and why? A dragon. I’d want to be fierce and firebreathing without a fear of heights. b. If you could go back in time and give yourself one piece of advice, what would it be? Take more chances—don’t be so worried all the time. c. In a few words tell us five things about yourself that nobody knows (until now). I know how to castrate pigs, sheep and cows (okay, not cows, but you know, little bulls). I’ve eaten beef tongue. And heart. I have a secret yearning to sing in musical theater. I have a morbid sense of humor (actually, that’s one that people may know about). And a sixth one, just because, Pharaoh really is my middle name. It’s not made up at all. Some might be wondering what the name Horngate is about. There is a magical connection to the notion of the Horned God, but there’s also a specific Montana connection. In Montana, a lot of people hunt and so collect antlers and create these arched gates for entrances made of antlers into their properties. (A lot of people also gather antlers that are shed each season—elk, deer and moose all shed theirs). Additionally, the other reason to use the horngate is because antlers represent a kind of renewal and growth—the animals lose them every year and grow them back and they come in bigger and stronger. All of these things really help represent what Horngate is. So I hope everyone is motivated to add Bitter Night to their TBB lists, but for one commenter.I am giving away a copy of Bitter Night to anywhere that the Book Depostory ships. Leave a comment/querstion for Diana or tell us about a favourite fictional witch or series. Open to anyone anywhere that the Book Depostory ships. Blog, tweet, post, etc., about the guest spot and contest for an extra entry. Giveaway ends Monday, October 26 at 11:59 PM EST. I'll post the winner on release day. Bitter Night sounds very good and I have added it to my to be bought list. Who are some of your favorite authors? Do you have one certain genre that you read or do you just read a bit of everything? My favorite fictional witch is Rachel Morgan from Kim Harrison's The Hollows. Thank you for the interview. At first I was put off by the cover, but the interview changed my mind. I'd like to give it a try. I grew up on a farm in Norway and I know how pigs are castrated. I've never actually castrated an animal though, that was the vet's job. I'm really looking forward to reading "Bitter Night"(if I'm not the lucky winner I'm going to buy your book!). I read about "Bitter Night" for the first time in a blog meme called "Waiting on Wednsday, a meme where book bloggers spotlights upcoming releases that we're eagerly anticipating and when I read the blurb I just knew that I had to read the book. Thanks for sharing this great interview, SciFiGuy, and for shipping this book with the Book Depository(because I know they're shipping to Norway yaaay!)! By the way, I love Andrews and Briggs' books! Have you read Simon R. Green? His Nightside series is awesome too. Thank you for the great interview with Diana Francis. BITTER NIGHT sounds intriguing and like my kind of book. I've added it to my ToBeRead list. I hadn't been aware of Diana before & am glad to learn more about her & her novels. goody a new to me author. Bitter night sounds very interesting and I'll definitely be adding to my tbb list. Is this going to be a series and if so do you have any idea of how many books are planned? I read a lot of different things, but of course my favorite is fantasy. Some authors I love are Anne Aguirre, Ilona Andrews, Patty Briggs, Carol Berg, C.E. Murphy . . . I could go on for quite awhile I'm afraid. It's an odd skill to know and I"m sure it will come in handy for us some day. It's rather fun imagining just when, isn't it? I haven't read his Nightside series, but I have read Blue Moon and a few other things. He's very fun. It is a series of two at this point. Any more will depend on whether my publisher wants to publish more. I have a great many stories I want to tell as the world falls apart and following different characters, but for now, I'm focusing on Crimson Wind and just telling a really good story with it. Bitter Night sound slike an awesome read! Did you have any say in the design of the cover? What is your take on the trend for urban fantasy books to feature an attractive woman on the cover. As I guy I think this tends to push men away from purchasing a number of series regardless if the novel is light on the the romance. I'm sure there's some marketing data that shows that women are the predominant purchasers of urban fantasy and a "traditional" cover ight push them away. With that said would you say Horngate is geared for both sexes? As an aside I've read your Path novels and do own the Crosspointe series but normally wait until a series is over to read them all in a row. I was asked to give some ideas for the cover scenes and then they ran with it from there. That's how the fire became prominent on the front cover. 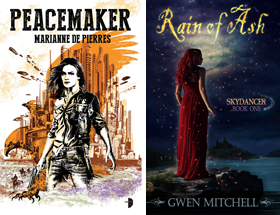 But really, authors get little or no say in any cover art. Hope you enjoy! And I hope you enjoy the Crosspointe books when you get to them. I really like the sound of Bitter Night so I'll have to buy it at some point unless I'm lucky enough to win it. My absolute favourite witch of all time is Mildred from the "worst witch" series of children's books. Thanks for stopping by, Diana. This sounds like a great new urban fantasy series and I can't wait to get my hands on the first book!! Can't wait for this book! Sounds so fun. Sorry you won't be at WFC to sign it. That was a great interview. And the book sounds really interesting (though I love pretty much all urban fantasy). I think my favorite witch is Tabitha from Bewitched, if only because I often find myself looking at dishes or filing and wishing I could just twitch my nose and it would all be done. I'm very excited to read this--I read the first two chapters and am hooked like a big hooked thing. I can't wait to see how the calorie thing comes in and bites them...because it has to, right? Great interview. Bitter Night sounds good. My favorite fictional is Samantha from Bewitched. My favorite witch is Alba from the book, BLACK BODY by H.C. Turk. It's always fun to read author interviews. I tweeted (I'm wyld_dandelyon on Twitter). I bet it's a good balance, to have that enmity between two major characters, and at the same time a very powerful reason for them to work together. I'll have to read it! I agree with Anna. My favorite fictional witch is Rachel Morgan from Kim Harrison's The Hollows. I am adding Bitter Night to my TBB list! My question is who is your favorite secondary character in your book? Bitter Night sounds like a great book. It's definitely going on my list. I truly admire someone who teaches college and is also an author. I like Camille who is a witch in Yasmine Galenorn's Otherworld series. Wish I could see you at WFC too. Maybe next year. Yay Julie! Hooked is GOOD. Meljprincess: I'm always up for good cookie recipes. Especially those that involve chocolate and peanutbutter. Oh, wow. What a question. I can't decide! I think if I had to pick one (besides Alexander), I would go with Lise. She's really snarky. Sorry it this was asked but how many books are you currently planning to finish the story arc? Bitter Night sounds like a great start. Awesome interview!! :) Can't wait for Bitter Night to come out. And The Hollow Crown. I love the Crosspointe series. You're an amazing author. Do I get credit for knowing who Missy S is? We're such a bunch of sheep, we LJ people. But my favorite interview moment may have been the correction about castrating cows. That was awesome. Hopefully you can contact me by commenting on my blog (??). Truthfully I never really read about witches. I did like the witch novels in the Night World by L.J. Smith and Jinx by Meg Cabot. One of my favorite witch series is The Southern With series by by Kimberly Frost. Bitter night sounds really good, and I'm definitely adding it to my TBB piles! I would have to say that Harry Potter is my favorite witch, or wizard as he is actually called. I have to say that one of my favorite witches from recent books I've read, is Tess Corday from Jes Battis' OSI series (Night Child & A Flash of Hex). Technically, the character is referred to as a mage, but whatever. I also really enjoyed the character Holly Carver from Ravenous: The Dark Forgotten by Sharon Ashwood. Hello Diana. Just loved the cover and would love to read Bitter Night. I'll ask a simple question: what are your favorite books? I though Pharaoh was something fun Diana added. Maybe as a way of revealing her secret love of ancient Egypt. I already have BITTER NIGHT on my "wish list" - it sounds awesome! My favorite fictional witch is Samantha Stephens from "Bewitched" since I grew up loving the show and Willow from "Buffy." A favorite fictional witch is Lavender Brown who was Ron Weasley's first girlfriend in the Harry Potter series. My favourite fictional witches are Rachel Morgan from The Hollows series by Kim Harrison and Paige Winterbourne from Kelley Armstrong's Women of the Otherworld series. Hi. My question for Diana is: Who is your favorite author? What is your favorite genre of books that you read in your spare time?